Firstly, thanks for choosing DearMob iPhone Manager! If you are finding DearMob iPhone Manager crack/torrent version or free license code, please read this official post that contains free DearMob iPhone Manager crack serial key and reasons why you should be careful to use DearMob iPhone Manager crack/torrent version from unidentified or unauthorized sites. 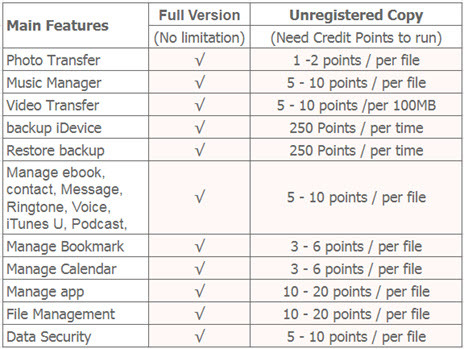 Why not Choose DearMob iPhone Manager Crack/Torrent Version from Unidentified Sites? Simply, it's illegal and unsafe! Cracked DearMob iPhone Manager license code has violated the software copyright law which is used to protect DearMob iPhone Manager customers as well as the affiliates. Free DearMob iPhone Manager crack serial keys from unauthorized sites are mainly offered for other commercial uses that you can hardly identify, and they are commonly invalid and will be blocked once being discovered. Worse still, you may also download some spyware or virus with the crack code that will exposure your computer and iPhone iPad iPod devices to potential dangers causing data missing and privacy loss. As these malicious sites haven't got the permission of the DearMob iPhone Manager developer officially to offer DearMob iPhone Manager registrattion code, the cracked DearMob iPhone Manager full version won't get the professional tech support and official upgrade plan as well. So, do not waste your time on such meaningless searching anymore. Here is the official place where you can get safe DearMob iPhone Manager license code without a dime or at a favorable price that you can afford. Get official DearMob iPhone Manager full license code at the lowest price with lifetime upgrade and professional tech support. 100% clean and safe. No bundleware. No virus. Keep your iPhone iPad iPod as well as computer away from unknown attacks brought by unidentified cracked DearMob iPhone Manager registration code. Get Unknown DearMob iPhone Manager Crack from Unauthorized Sites? Not Recommended. Crack DearMob iPhone Manager license code from unauthorized sites would not get professional technical support and official upgrade plan. Due to copyright infringement, the cracked DearMob iPhone Manager license codes you find on unidentified sites will be blocked once being discovered. Downloading cracked version is illegal, and most of cracked software contain potential dangers that will harm your computer, say adware, malware & virus. To thank for your supporting DearMob iPhone Manager, the official site has offered 2 ways to get DearMob iPhone Manager full version serial key. With DearMob iPhone Manager full license code, you have much freedom to manager your iOS devices without restrictions that DearMob iPhone Manager trial version can't provide. Simply backup & transfer iPhone iPad data media to Mac/PC in a click, import/export photos, music, videos, books, calendars, etc, install/uninstall apps or make iPhone ringtones from YouTube, Soundcloud, Dailymotion, encrypt iPhone backup/photos/videos/contacts and more. 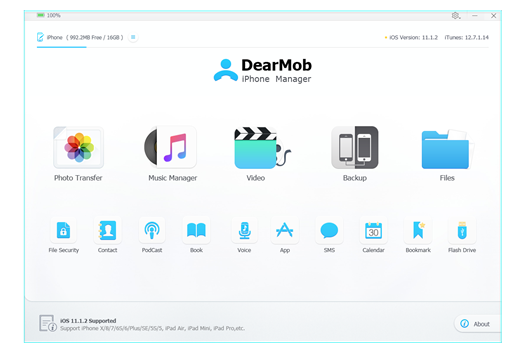 But, you can still free download DearMob iPhone Manager trial version to have a try before getting dangerous DearMob iPhone Manager crack license code. * iOS 12 & iPhone XS/XS Mac/XR supported. * Lifetime free upgrade plan and technical support. * Export 3 voice memos or messages is allowed without export option. Solve iOS 12 not Showing up Problems on iPhone iPad. Manage, backup and transfer data on iPhone iPad.